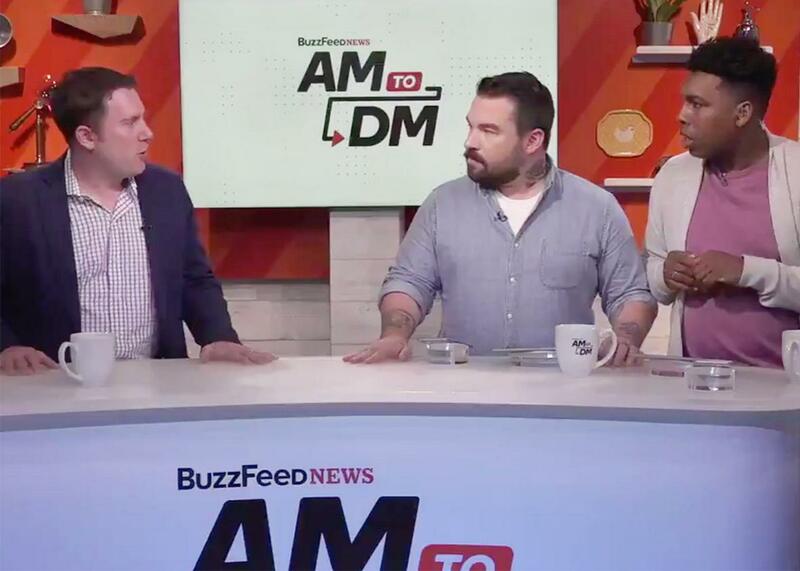 BuzzFeed’s AM to DM is as bland as every other morning show so far. BuzzFeed’s new morning broadcast was supposed to shake up a bland genre. So far, the show mostly mimics it. From left, BuzzFeed editor in chief Ben Smith shares breaking news with AM to DM hosts Isaac Fitzgerald and Saeed Jones. With AM to DM, the new BuzzFeed new morning show that premiered Monday, the internet behemoth promised a program that wasn’t “just on Twitter, it’s for Twitter.” In one clever promo for it, hosts Saeed Jones and Isaac Fitzgerald are literally trapped inside a Twitter stream, underscoring its web-native ambitions. But reinventing a medium—in this case, the staid network morning show, which Megyn Kelly also spent Monday morning trying to reinvent—isn’t easy, especially at a time when stalwarts like Good Morning America, Today, and the entire stable of late-night TV have already, often with great success, become shows for Twitter. If traditional TV is already internet TV, what does an internet show with broadcast trappings have to offer? The premiere of AM to DM had some slightly underwhelming answers to that question, as well as some glitches. First off, that ad I mentioned aired during the actual show—why do I need to see a spot for a show I’m already watching? And why does this internet show feature something as old-school as commercials, anyway? The live stream, nestled on a Twitter Moments page, also seemed to break at a few points, causing what was supposed to be an hourlong show to run 11 minutes into the next hour. BuzzFeed will have to work out these kinks on the fly: The show will stream live on Twitter every weekday at 10 a.m. Eastern for at least the foreseeable future. BuzzFeed has had online shows before, including one that aired during the presidential campaign. The company is aiming bigger with this one, having pulled Jones and Fitzgerald off their full-time jobs as editors and hired an experienced production team to create what it hopes will be “the hottest show airing in the 10 a.m. hour,” as a spokesman told the Hollywood Reporter. For all the talk of its internet DNA, though, the show looks a lot like a traditional morning show: Two affable hosts sit on a set and banter their way through news segments and interviews. The result, on Day 1, felt a little like Today and a little like TMZ’s sassy celebrity-dirt show. Both hosts are surprisingly natural on camera—surprising not being a neg but an acknowledgement that such is not the case for most internet writers and editors, myself included. Credit for that probably goes to the monthslong warm-up period BuzzFeed gave them, another signal the company is really committed to this project. Other BuzzFeed personalities also appeared on camera, sometimes in the studio and sometimes via video conference (synergy!). The hosts trumpeted AM to DM’s ability to respond to its viewers and the news, but aside from a few updates to correct small errors and the reading of a few tweets that came in during the show (as well as a stream of tweets below the video on Twitter and in the app, which is something broadcast shows have featured to some degree for years), not much seemed to genuinely change direction on the fly. Twice the show announced “scoops” on camera, which felt a little false: The chances that BuzzFeed editors chose to publish those scoops during the 10 a.m. hour precisely in order to promote them on the show seem pretty high. The top of the show focused on news, specifically of the Trumpian variety. This wasn’t fun, because Trump is not fun, but he’s also unavoidable, which makes you wonder how different this show might have looked if What Happened in November had not. Displaying and dissecting tweets on screen is a big part of AM to DM, which is well-suited to our Twitter-loving president, who knows his tweets are news. I don’t watch many traditional news and morning shows because I’m part of the millennial audience that BuzzFeed is chasing on Twitter, but don’t those shows talk about Trump’s tweets too? Don’t they kind of have to? It’s where he lives, so it’s where we all live. After the Trump update, it was time to read some fire tweets in the segment called, well, Fire Tweets. These tweets were kind of funny, not particularly newsworthy, and in some cases, of course, from BuzzFeeders. But they didn’t feel very fire, come to think of it. Compared with reading a funny tweet that’s been retweeted into your timeline, hearing a funny tweet read by a host isn’t particularly Twitter-native, innovative, or useful. It’s not very telegenic, either, because of the dancing-about-architecture factor, that eternal problem of removing a message from the context of its medium. Is this really where the internet was supposed to take us? Screenshots being live-streamed? Trump’s Twitter obsession may be a particularly strong example of this, but increasingly there’s little daylight between what happens on the internet and what happens in “real life.” That’s the bigger question BuzzFeed’s “for Twitter” show will have to contend with. All shows, not just internet shows, now play to the internet, either because they’re made for streaming or because they’re hoping to make up for lost viewership with viral attention. For the last few years now, late-night shows have increasingly felt like strings of easily segmentable viral baubles; most news organizations have teams dedicated to repackaging whatever is bubbling up on Facebook and Twitter. All shows are already internet shows. All news organizations are internet organizations. We know that broadcast has a lot to learn from the internet; it’s less clear, so far, what an internet production stands to learn from broadcast, or why such a program might top or at least supplement the fire tweets you’re already ignoring your job to scan each morning. Of the show’s audience, BuzzFeed’s editor-in-chief Ben Smith told the Hollywood Reporter, “One thing we know about them is that they’re on Twitter, which is to say that they’re maniacs.” He’s not wrong: Twitter is for a very specific group of maniacs—well, 157 million of them reportedly use the app daily—but Twitter means different things for different people. We all curate our streams, which is why there’s journalist Twitter, sports Twitter, film Twitter, black Twitter, politics Twitter, and so on, an infinite number of Twitters that overlap and feed off each other and to which BuzzFeed’s writers cater to with listicles and quizzes and news reports that don’t need to reach all of them, just a lot of them. But a show needs to treat these Twitter clans like a mass audience, which means it has to go broad. Segments like Fire Tweets and #ManCrushMonday may have been nods to the Twitter crowd, but they played like blandly appealing feel-good segments in a vaguely internet-y mold. Donald Glover was declared the inaugural man crush because on the internet we like Donald Glover, and the show spent a few minutes talking about his triumphs and history-making at the Emmys … which were more than a week ago, an eternity in internet time. Despite its hip internet-honed voice, the show felt familiar and generic, hardly the niche, generationally savvy product BuzzFeed has touted. That was probably the right call, in a way. A show that was truly for insiders—say, a live-streamed version of the old Today in Tabs newsletter that synthesized the daily controversies of digital-media Twitter—wouldn’t make sense to everyone else on Twitter. But would it have been more fun? It’s understandable that the first AM to DM played it a little safe, that its Fire Tweets were more Bic lighter than volcanic eruption. There will be time for the show to evolve and grow; it takes most programs more than one episode to work up to flaming hot magma. AM to DM may get there, but it also may discover what most morning shows did long ago: that their job is to comfort, not to challenge. And that means being kind of bland. With AM to DM, this would be a modern internet-flavored kind of bland, a little more wacky than the network morning shows, but bland nonetheless. Consider segments from Monday like the interview with Rep. Maxine Waters and the sit-down with hunky actor Kofi Siriboe (good job, bookers), both of which brought nothing particularly internet-specific or distinct: Waters isn’t just an internet sensation, she’s an everywhere sensation. And the Siriboe segment, while charming, wasn’t markedly different from a late-night couch appearance. Siriboe read a few of his tweets out loud, which, though entertaining (“let’s be friends so I can rub your booty,” he read at one point, the kind of moment producers engineer because they know it will be GIF’ed) echoed about a million late-night segments and viral videos. Siriboe was relaxed; Fitzgerald asked him about Oprah and the actor responded, “Oprah’s amazing, and she loves to touch me,” before stopping himself and adding that what he just said “sounded way worse than it is.” But that’s OK, he went on, they were in the kind of casual, anything-goes environment where he could talk like that. Weren’t they? I’m not so sure. Siriboe started his interview with his shirt unbuttoned halfway down his torso, revealing an impressive amount of chest. Somewhere along the way, though—I missed when—he buttoned at least another, and maybe two more, buttons. Did a producer whisper to him that he needed to look more presentable, or did he opt for a more buttoned-up look on his own? Either way, I would rather live on an internet, and watch an internet morning show, where that shirt stays half-unbuttoned.